The harsh environment of heavy industry places high demands on the design, availability and the functions of an intercom station to ensure reliable communication. The Access Panel, the IP desktop intercom station from INDUSTRONIC, has been designed according to the latest state of the art and complies with the applicable safety regulations and demands of heavy industry. Our customers’ requirements also had an important influence on the design of the intercom station. The compact Access Panel integrates a modern color touch display with easy-to-use menu, numerous display and operating functions on several layers as well as mechanical keys with multi-color status indication that allow for convenient and safe operation under extreme conditions. The resistive touch display responds to pressure on its surface and can therefore be operated with industrial gloves, a stylus pen or simply with the touch of your fingertip. The functional extensions offer further flexibility. There is also the option to fully customize the display buttons in size, shape, and color according to your needs. The gooseneck microphone can be used for general public announcements or operating instructions across connected speaker zones. You can recognize the status of the microphone from the color of the illuminated ring at the bottom. The gooseneck microphone is monitored according to the DIN EN 60849 standard and in case it fails, the conversation automatically switches to the integrated additional microphone. 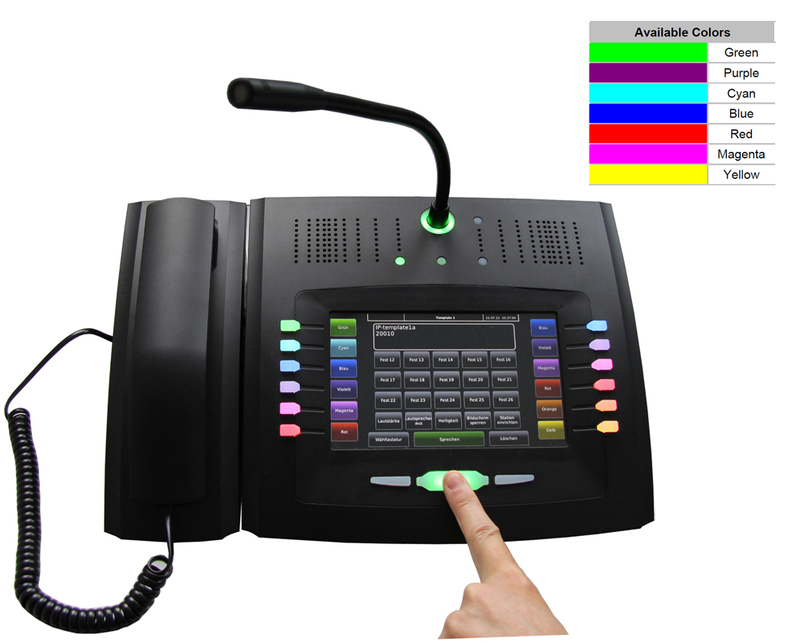 The handset is ideal for having extended conversations in privacy with other subscribers or a control room, for example. The LEDs around the microphone indicate the operating status of the device and the connected system. You can also recognize if voltage is applied. The modern technology of the Access Panel meets the communication needs of any workplace and is ideal for use in industrial environments. Thanks to its modular design it can be quickly customized. Find more information on the Access Panel by clicking the following link.